Water supplies are one of, if not the most, important facets of agriculture. So it is with great pride that Kojonup Agricultural Supplies is a Davey Master Dealer outlet. This means that not only do we sell the quality products of the Davey range, but we also have the expertise to provide the back up and servicing requirements on site. This can prove invaluable in terms of time and money saved in not having to freight the pumps away. If pump parts aren’t available overnight we also offer temporary replacement Davey pumps until the repairs are completed. Kojonup Agricultural Supplies is very fortunate to have our expert staff, Michael and Geoff, who have not only received the latest training from Davey and are familiar with all the Davey products, but are also fully qualified tradesmen with a combined 45+ years of experience in electrical and mechanical repairs. Electrical pumps can have the Torrium®2 controller which offers constant pressure and protects the pump from damage by shutting it off when it senses loss of prime, high water temperature or excessive electrical current. 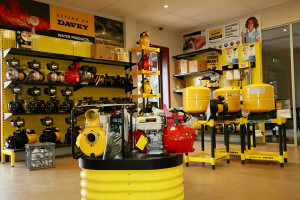 With over 30 water pumps on hand, you can depend on Davey and you can depend on us here at Kojonup Agricultural Supplies.